Cigarette smoking is injurious to health – this message is printed on every pack of cigarettes sold and yet there are many, many people who find it really difficult to quit smoking. There is quite a variety of products available today that are designed to help one quit the habit. Among these is Nicotine Replacement Therapy chewing gum. The principle behind this chewing gum is to provide the body with nicotine while a person is in the transitional phase of quitting cigarettes. 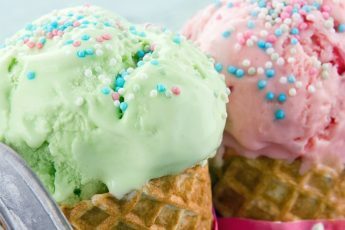 The body is used to nicotine from cigarettes and NRT products replace this nicotine and curb the craving for cigarettes. Chewing gum is easy to carry and easy to use. NRT is a proven therapy that aids in quitting smoking and nicotine gum is also known to work. There are quite a few brands of nicotine gum available today. 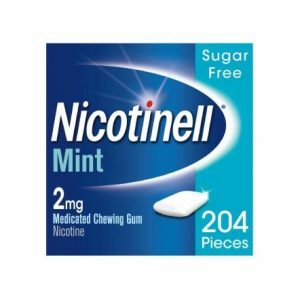 Here’s a list of the best nicotine gums in India of 2018 with prices. Cipla is a mega pharmaceuticals company founded in 1935. 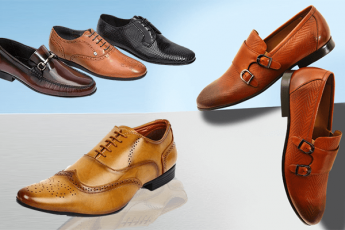 It has its headquarters in Mumbai and its products are sold around the world. The company has acquired many pharma companies in various countries and has also established joint ventures in an effort to expand and spread its business. Currently its annual turnover is to the tune of several billion dollars. Nicoitex is a product from Cipla Limited. This nicotine gum helps smokers quit smoking cigarettes in 12 weeks. The gum is based on Nicotine Replacement Therapy or NRT, a clinically proven therapy used to help fight the addiction to cigarettes. For all your pharmacy needs get Coupons for OTC and prescribed medicines on GreatBuyz. Nicorette is the first Nicotine Replacement Therapy or NRT product available to consumers. 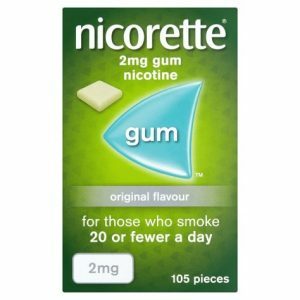 Developed in chewing gum form in the late 1970s, Nicorette is now a brand name that is used on a variety of NRT products ranging from gum to sprays, lozenges, and tablets. The name Nicorette was created combining the words nicotine and ‘rette’, the Swedish word for ‘right way’. Nicorette gum is a great tool that helps you quit smoking. The gum helps combat nicotine craving which is what triggers the urge to smoke a cigarette. When one stops smoking cigarettes the body craves nicotine which the gum provides and thus one can overcome the urge to light up. Rusan Pharmaceuticals, the manufacturers of 2baconil, is a global pharmaceutical company that focuses on de-addiction and pain management solutions. Its products are available in numerous countries across Asia and Europe. 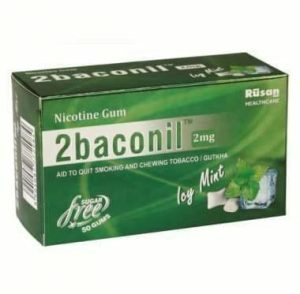 2baconil nicotine gum is a first class product to aid anyone who is trying to quit smoking. 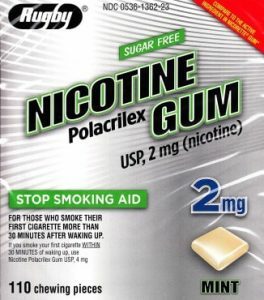 The gum releases controlled amounts nicotine into the body keeping withdrawal symptoms at bay. Habitrol is an NRT product from Dr Reddy’s Labs available in patch and gum forms. Dr Reddy’s Laboratories was founded by Dr Anji Reddy in 1984. The company has a wide range of products ranging from medications, pharmaceutical ingredients, and diagnostic kits, to name a few. The headquarters are in Hyderabad and the business is spread worldwide. 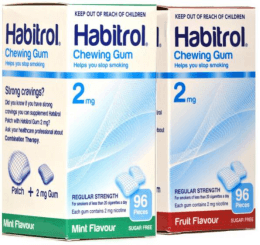 Habitrol Chewing Gum is available in mint, and fruit flavours and is an excellent product for those who are trying to quit the smoking habit. Nicotine replacement gums are proven to help with withdrawal symptoms that arise when a person quits smoking cigarettes. Headaches, sweating, irritable moods, anxiety, etc., can affect daily life making the transitional phase from smoker to non-smoker very difficult. Nicotine gum helps make this transition smoother. Nicotinell is a British brand of NRT and other smoking cessation products. The brand is owned by pharmaceutical giant Novartis that also has offices in India. Novartis is a Swiss company with a strong global presence in the pharmaceutical sector. Novartis is considered one of the biggest pharma companies in the world with after sales figures crossing $50 Billion in 2017. Nicotinell helps reduce withdrawal and other uncomfortable symptoms that manifest when a person quits smoking. The body’s craving for nicotine is satisfied through the low doses of nicotine present in the gum and thus one finds it much easier to battle the urge to light up a cigarette, and ultimately to quit the habit entirely. Rugby Laboratories is based in Duluth, Georgia in the US of A and is well known for its wide range of over the counter medicines that it supplies to pharmacies and drugstores in the US. It is also well known for its nicotine gums and other NRT products. Nicotine gum as an aid to stop smoking is quite a popular choice and Rugby laboratories have a sugar free variety in this category. The mint flavoured Sugar Free Nicotine Gum is available in a double pack with 110 gums in each box, giving you a total of 220 pieces of gum. 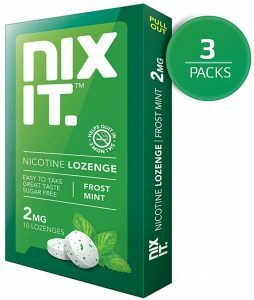 This nicotine gum reduces withdrawal symptoms that result when you quit smoking and also quells the heightened craving for food which can occur at such times. 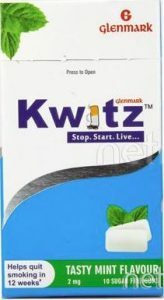 Manufactured by Glemark Pharmaceuicals Ltd, Kwitz is a standard Nicotine Gum that aids to stop smoking. Glenmark has its headquarters in Mumbai. The company was established in 1977 by Mr Gracias Saldanha to manufacture generic drugs and active pharmaceutical ingredients. Saldanha named the company after his two sons. Kwitz Nicotine Gum is available in a tasty mint flavour and is very affordably priced. The chewable gum helps smokers quit in 12 weeks. Nixit is another brand well known for NRT, which comes in a Lozenges form. It focuses on steadily reducing the nicotine intake, and leaves a pleasant minty flavour in the mouth. It requires no chewing and is sugar-free making it one of the most sought after NRT options available in the market. The decision to quit smoking is the first step to a healthier life but the road to a healthier life is not always easy or smooth. Help, however, is available in the form of NRT chewing gum which is discreet and helpful. 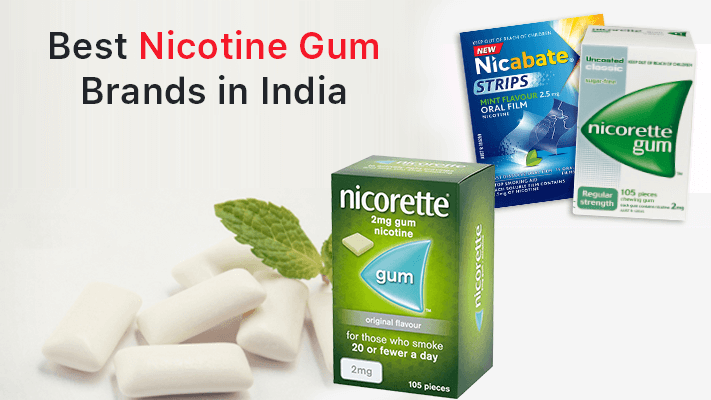 Choose one from the list of the best nicotine gum brands in India given above and set out on your way to a healthier lifestyle.